Geography is taught throughout the School by four members of staff (including the Head of Department). The department is well-resourced for all key stages and continues to be updated to meet the changing geographical world. It has two dedicated teaching rooms for KS3/4 and one for Sixth Form teaching. These contain teacher PCs and state of the art SMART interactive boards. The department has a proud record of developing the use of ICT to support effective learning and teaching, and has developed a range of innovative approaches to improve attainment, such as integrating the development of ICT skills within the subject at KS3 to ensure progression to a high level of competence by GCSE. The department makes frequent use of the School’s IT suites and class sets of laptops to support the students’ learning, and enables the students to access a very a wide range of digital resources on the School’s VLE and elsewhere, as well as specialist software. Future development plans will include reviewing and refining the new GCSE and A Level programmes of study. In addition, the department is moving to incorporate ArcGIS into all key stages to equip the students with the skills needed for fieldwork investigations at GCSE and A Level. The department is a member of the Geographical Association and the recently established London branch, as well as the Royal Geographical Society. The School is set in over 21 acres of beautiful grounds which provide the space to be physically active, to play and to be creative. The nearby Northwood station (on the Metropolitan Line) provides easy access by Underground from north-west and central London, we are close to the Hertfordshire and Buckinghamshire borders. 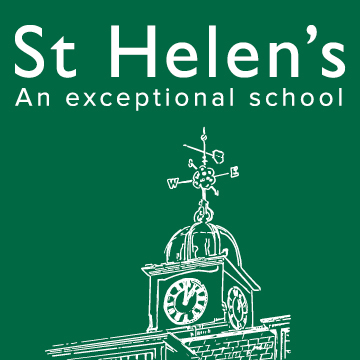 Our excellent transport links and our own coach services mean that St Helen’s attracts girls from a wide and varied catchment area. Our mission is to provide an exceptional all-round education and to develop young women both through excellent academic teaching and providing vibrant and exciting opportunities to extend their horizons, making the most of our first-class facilities. We cherish the enduring values of the School, but also embrace innovation. By providing our girls with the opportunities and the skills necessary to succeed, they will be prepared to lead and make an exceptional contribution to wider society. All girls are respected as individuals and are encouraged to take risks, embrace opportunities to challenge themselves and fulfil their potential in a happy, supportive and tolerant environment. By the time they leave us, the girls are confident, and independent, ready to take their place in the world.